2K Czech will be losing some people. 2K Czech, the studio behind the Mafia series, is in the middle of a shake-up. Its Prague office is shutting down and will be sending some of its staff to Brno, while others - about 10 developers - are said to be relocating to 2K's main office in California. It's not immediately clear what this means for yet-to-be-officially-announced Mafia 3, but according to 2K layoffs are expected. "This transition will both strengthen the integration of the 2K Czech team with our award winning development teams, and better align cross-functional business practices," says 2K. "As part of this realignment, we are adjusting our staffing levels, resulting in the elimination of some positions." 2K has yet to confirm how many will be let go. 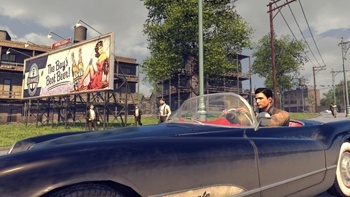 Mafia 2 earned reasonable, if not spectacular, reviews, but there were suggestions that, thanks to a long development cycle, it might not be profitable. A sequel is suspected to be in development for next generation consoles. However 2K's response to internet speculation has always been that 2K doesn't comment on internet speculation. For now, all we know for sure is that the studio probably in charge of making Mafia 3, if it exists, is about to be reconsolidated.